DMZ-Hawaii’i/Aloha ‘Aina is a network of organizations and individuals representing various movements and communities, as well as international allies. DMZ stands for demilitarized zone. Aloha 'Aina means love for the land. DMZ-Hawai’i/Aloha ‘Aina has united environmental, peace, anti-nuclear, women’s, religious and Kanaka Maoli sovereignty and independence groups. Its current campaigns are opposing the Stryker Brigade, Navy University Affiliated Research Center and the University of Hawaii, and supporting the struggle to clean up and return of Makua Valley. The network has carried out these campaigns through pickets, marches, civil disobedience, lawsuits and Kanaka Maoli cultural forms of resistance (Kajihiro, 2007). Women who are connected to DMZ Hawaii/Aloha Aina organized Women's Voices Women Speak. This group emerged out of a delegation of women who attended the 5th East-Asia-U.S.-Puerto Rico-Women's Network Against Militarism meeting in Manila, Philippines. WVWS continued to mobilize and expand its connection to more women, to attend the 6th and 7th International Women's Network Against Militarism meeting in San Francisco and Guam. 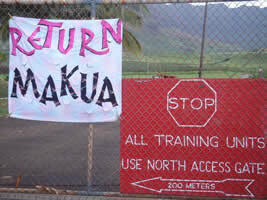 This mission of WVWS is organize on Kanaka Maoli Sovereignty and demilitarization in Hawaii from women's perspectives. To read more about the herstory and work of WVWS, visit their blog at wvws808.blogspot.com. On July 6, 1898, U.S. Congress authorized the seizure of Hawaii as a U.S, territory because of its strategic position for American imperial interests. Between World War II and the Cold War, the Pacific Command (PACOM) has made Hawaii into a military surveillance center of the Pacific. The military controls 236,303 acres, or 5.7% of total land area in Hawaii. On the island of Oahu alone, 22.4% is controlled by the military. The federal and state government continue their seizure of government and crown lands of the Hawaiian kingdom. 54 percent of the military-controlled lands are former crown lands. Kanaka Maoli have highest rates of homelessness, poverty, disease and crime in Hawaii. They make 36.5 percent of persons incarcerated for felony charges. Hawaii’s youth are highly recruited into the military due to the No Child Left Behind Act and ROTC programs in their schools. In 2003, military expenditures have been the second largest industry in Hawaii, after tourism. Resistance to Militarization in Hawaii has been to resist the bombings and clean ups of Kaho’olawe, the return and clean up of Makua Valley. Resistance to the H-3 Freeway, Navy expansion at Nohili, military training at Waikane Valley, military training in Pohakuloa, Navy University Affiliated Research Center, “Star Wars Missile Defense” at Nohili, Aircraft Carrier Strike Group at Pearl Harbor. 2007 A Brief Overview of Militarization and Resistance in Hawaii. A DMZ-Hawaii/Aloha ‘Aina Paper. Accessible at: www.dmzhawaii.org.